CO2 Casting is a kind of sand casting process. In this process the sand molding mixture is hardened by blowing gas over the mold. This process is favoured by hobby metal casters because a lot of cost cutting can be done. In addition, one can be sure of getting dimensionally accurate castings with fine surface finish. But, this process is not economical than green sand casting process. 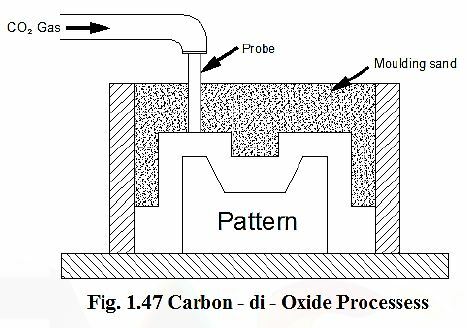 The Mold for CO2 Casting is made of a mixture of sand and liquid silicate binder which is hardened by passing CO2 gas over the mold. The equipment of the molding process includes CO2 cylinder, regulator, hoses and hand held applicator gun or nozzle. Carbon di oxide molding delivers great accuracy in production. Any existing pattern can be used for the molding purpose which can be placed in the mold before the mold is hardened. This method helps in producing strong mold and cores that can be used for high end applications. If the process is carefully executed then casting can be as precise as produced by the shell casting method. Carbon di oxide casting is favored both by the commercial foundry men and hobbyist for a number of reasons. In commercial operations, foundry men can assure customers of affordable castings which require less machining. The molding process which can be fully automated is generally used for casting process that require speed, high production runs and flexibility. In home foundries this is one of the simplest process that improves the casting quality. CO2 casting process is ideal where speed and flexibility is the prime requirement. Molds and cores of a varied sizes and shapes can be molded by this process. f. This process can be fully automated.